There's a battle going on in dentistry today, and you're in it, whether you like it or not. Around the world, the number of patients per dentist is progressively dropping. Australia now has 1 dentist per 1,430 people. The USA has 1 per 1,641, Canada has 1 per 1622, and the UK 1 per 1426. Since around 50% of the population does not visit a dentist, we’re down to some pretty small practice numbers per dentist in western countries. A general practice with under 500 unique patients is usually struggling. To make things worse, we have the booming dental tourism industry. 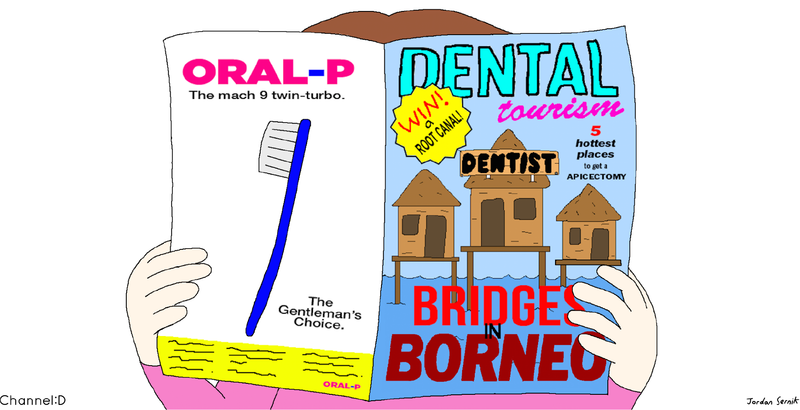 Getting accurate figures for the size of dental tourism is hard. Medical tourism in 2015 was a US$300 billion global industry. The sector quadrupled in 5 years from 2010-2015. These are sophisticated enterprises, they know how to maximize the use of social media, and the trend is likely to continue to grow. They package airfares, hotels, holiday packages and even provide insurance to cover complications. There are thousands of testimonials throughout the internet supported by well-produced video interviews with doctors and patients. In some countries, the governments are directly funding marketing campaigns devoted to growing this sector. If you think you can out-promote a government you’re wrong. Know this: dental tourism is NOT going away. If you want to survive this war, you have to be smart. Most dentists will try to talk their patients out seeking treatment overseas. They’ll emphasize the risks of unregulated standards, inadequate training, poor hygiene, lack of support, etc. While much of this is true, the reality is, they’ve probably spent more time researching this than you have. Telling them what they already know is not going to change their mind. What they do know though, is that your quote of $50,000 for treatment would be $9,000 in some far-flung overseas oasis, and that’s WITH a holiday thrown in. It’s easy for a patient to misinterpret your dire warnings as being driven by financial interest. If they decide to go against your advice, they probably won’t feel comfortable ever coming back to you. I said before you had to be smart. This is a much smarter way to discuss dental tourism with a patient. Find a way to agree with whatever they say e.g., “It’s good to have a close look at all your options” or “Yes, I can understand why you’d want to do that.” By expressing empathy and positioning yourself on the same side as the patient, you are better able to be viewed as a trusted advisor. 2. Ask them to share with you their fears regarding the treatment. 3. If possible, get them to elaborate on what their fears are. “What sorts of problems have you heard about?” The point here is to have them verbalize some risks to you. So far all you are doing is agreeing with them. Now you continue to agree even more. Chances are you will have come across a case that exemplifies the risk they mentioned. 4. If you can share that story, you are helping to add credence to their (expressed) risk. You need to position yourself as a neutral arbiter. Therefore, avoid saying anything like “I think it’s a big risk.” Focus more on the fact that having simple dentistry is not a risk because anyone here can make any adjustments. But complex dentistry involving say, implants or changes to the bite, is a different matter. These things require ongoing maintenance, and the best person to maintain complex treatment is the person who did it. So, you haven’t said anything negative about anyone. You have, however, inserted an example of a problem, and it was only said in relation to what the patient already mentioned. This sort of agreeable, non-confrontational approach may sway the patient’s mind, and certainly helps you keep the patient, even if they do elect to have treatment elsewhere. As a dentist in private practice in Sydney and London in the 70s, I always had an interest in the “real” challenge of dentistry. No, the real challenge isn’t finding the fourth canal in upper first molars. The real challenge is getting patients to want the treatment we train so hard to learn. Over many years, I developed communication solutions for my practices that proved very effective. I started wondering how I could help other dentists benefit from this knowledge. That led to a career in dental education, teaching courses all over the world on patient communication, specifically the new patient exam. Something wasn’t right though. I always felt what was really needed was a communication tool to take the burden off the clinician. Videos in the reception room was the logical answer, but nothing on the market spoke to patients in a language they could relate to. So, out of necessity, Channel D was created. Don’t take my word for it though, decide for yourself. Click on “Sample Videos” above and find out why patients love it. If you love it too, click on “Getting Started” and sign up for a 30-day free trial. You have nothing to lose, and a lot to gain.